By Mike Smith: Top Rank promoter Bob Arum is already planning to match WBA/WBO lightweight champion Vasiliy Lomachenko against #1 WBC Luke Campbell (20-2, 16 KOs) next in a fight in England if WBC lightweight champion Mikey Garcia decides to vacate his title rather than defend it against the British fighter or face Loma in a unification. Arum wants Lomachenko to add Mikey’s scalp to his collection, and take his WBC belt from him at the same time. The Top Rank promoter says there is no such thing of bad blood between him and Mikey, who used to fight for his Top Rank stable, as the money that can be made is the important thing. Mikey, 31, hasn’t revealed what his plans are when it comes to his World Boxing Council lightweight title, but it’s believed he’s going to give it up rather than come back down to face his WBC mandatory Campbell. Mikey’s last fight was at welterweight against IBF champion Errol Spence last March. While there’s been a massive amount of speculation from boxing fans in trying to guess what Mikey’s next move will be, no one knows for sure what he’ll be doing. Arum is planning on trying to setup a unification fight between Lomachenko and Campbell, 31, possibly in England if the WBC belt is vacated or stripped from Mikey. It sounds like Arum is getting a little carried away. 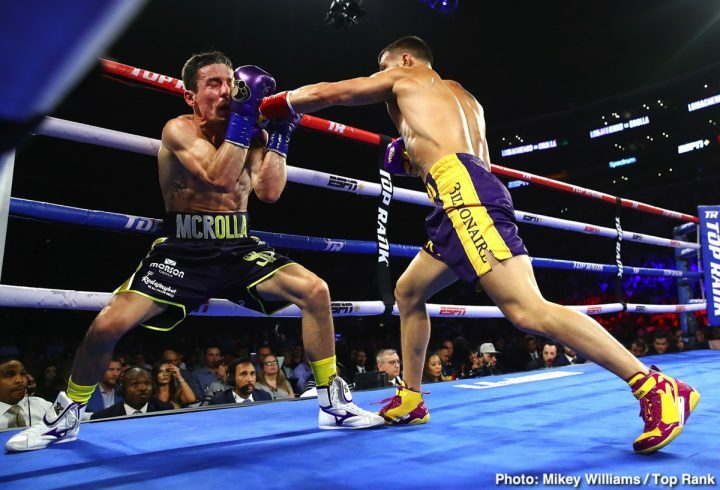 Lomachenko couldn’t do what Errol Spence Jr. did to Mikey in out-boxing him over 12 rounds, and making him look bad. If anything, Lomachenko might be able to win a close 12 round decision over Mikey, but it wouldn’t be a lopsided affair like we saw with Spence-Garcia. Lomachenko might get knocked down two or three times by Mikey along the way. Jorge Linares put Lomachenko down, and he’s not a big puncher. Lomachenko could lose to Mikey if he gets caught by one of his shots. Mikey was hitting the much bigger Spence with powerful pot shots, but he didn’t quite have enough size and strength for his punches to have an effect on him. It’s good that Arum isn’t vindictive at this point, because then he’ll never get Mikey to agree to fight Lomachenko. Mikey is likely seeing it a dollars and cents thing too. He can make more money fighting at 140 and 147 than he can in staying at lightweight, and languishing in that weight division with the lack of big name opponents. There’s only two money fights there for Mikey at lightweight, and one of them is about to disappear once Teofimo Lopez moves up to light welterweight. “It will be a very historical fight because it will be two Olympic [gold medallists]. I love the UK fans, I love UK boxing people, they understand boxing. So I want to come to the UK and fight with Luke Campbell,” Lomachenko said. Lomachenko wants to make a name for himself in the UK by fighting Campbell. That would be an interesting fight for the boxing fans. Campbell has never had a big fight during his six-year pro career. This would give him a chance to be involved in a big fight. Although Campbell fought Jorge Linares in September 2017 in losing a 12 round split decision, that wasn’t a big fight. It was obviously an important one for Campbell due to Linares having the World Boxing Association lightweight title in his possession at the time, but the fans didn’t see it as a huge affair. Campbell complained afterwards that he felt he should have been given the win, but it looked to most fans that Linares dominated the first four and last four rounds with his hand speed and combination punching. Lomachenko will be a lot harder fight for Campbell, and there may not be a need for the judges in this one.